Marmots (also known as rock chucks) are indigenous to the western half of the United States. Cousins to the east coast woodchuck, Marmots are more likely to reside in elevated landscapes and have been found throughout most of the northwestern states. They readily occupy rock piles and will dig deep descending burrows around these protective objects. Since marmots will readily claim a 4 to 5 acre territory, they’ve proven to be comfortable traveling great distances to find food. This is when they can become a nuisance. Marmots love most any garden grown vegetable and if given the chance, they’ll readily graze leading to rapid crop loss and damage. Marmots start reproducing at 2 years of age. 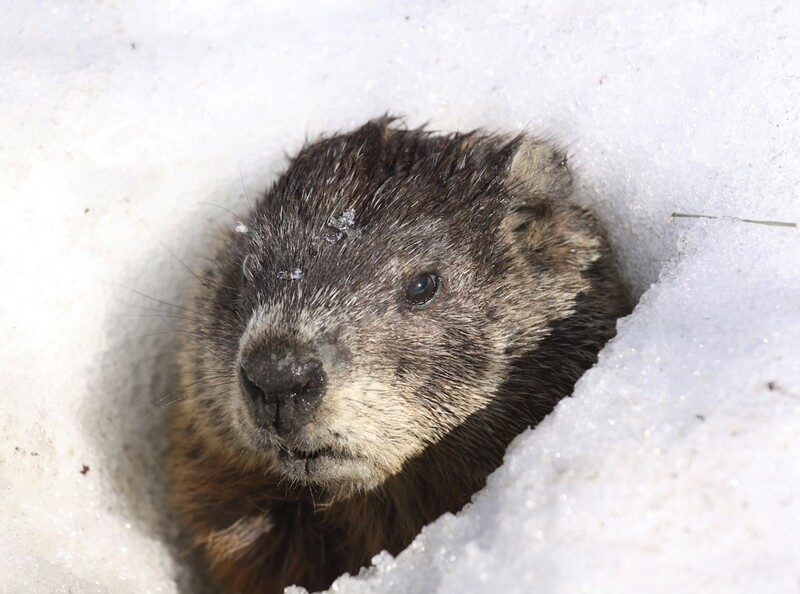 Colonies can support 10-20 individuals and though they’ll hibernate during cold winters, marmots can remain active during this time if temps are mild. New colonies develop when teenage males (1-2 year olds that leave established colonies) move to a new territory and dig a new home. Once these bachelors have their new home, they’ll aggressively seek multiple females as mates. Male marmots will try to get at least 3-4 females to live with him and once they move in, breeding will start and continue all summer long. Females will produce 3-5 pups per litter so as spring turns to summer, they’re food requirements can become quite substantial. This is when conflict with man can occur. Especially in dry arid regions where succulent plant food is limited. In such areas, marmots will travel as far as is needed to find a decent food supply for their young. Marmots have natural predators like coyotes, fox, bobcat, cougar and timber wolf. Because they’re naturally afraid of these predators, one can use the urine of these animals as a barrier to keep marmots off your property.You can also use sound to keep them away. Marmots have a keen sense of sound and our ultra sound devices are super effective at keeping them away. If you want to use animal urine to repel marmots, use one which is native to the area. In other words, if you have cougar or bobcat in your region, their urine will work. But if you don’t have timber wolves, it’s not likely marmots will be afraid of the scent. So if you know of a nearby marmot population that lives just off your property and you’d like to keep them from burrowing on your land, apply some COYOTE, FOX, BOBCAT, COUGAR or WOLF urine to create an invisible “fence” over which marmots will not travel. Do this by applying 1-2 oz of urine every 10-15 feet along the side of your property boundary where marmots are most likely enter. Applications will remain active for 30-45 days and should be applied late winter through the spring and summer months since these are prime time for marmot migration. 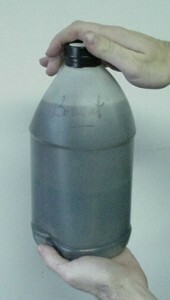 To enable urine placements to last longer, make your placements using either CAPSULE GUARDS or LIQUID GUARDS. Either of these protective devices can be placed on the ground and when filled with urine, will protect it from the sun and rain. This protection will enable the urine to remain active for 60-90 days so that over time, either of these urine guards will pay for themselves many times over. Since marmots will sometime target specific plants in the yard, the use of urine alone may not be enough to chase them off the land. For extra protection, apply PEST RID GRANULES around the plants, flowers and shrubs you want to protect or if you have reason to believe the marmots might target them for some reason. 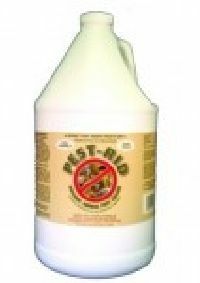 Pest Rid has an odor rock chucks don’t like and will avoid where its been applied. Another effective way to keep marmots off your land is to install our ULTRA SOUND REPELLERS. These units have many features making them particularly effective on marmots. First, they use ultra sound by default. Ultra sound is particularly irritating to marmots who have a keen sense of hearing. They do not like the sound and will stay away from where its heard. Second, our units also have an audible sound which includes predatory birds. 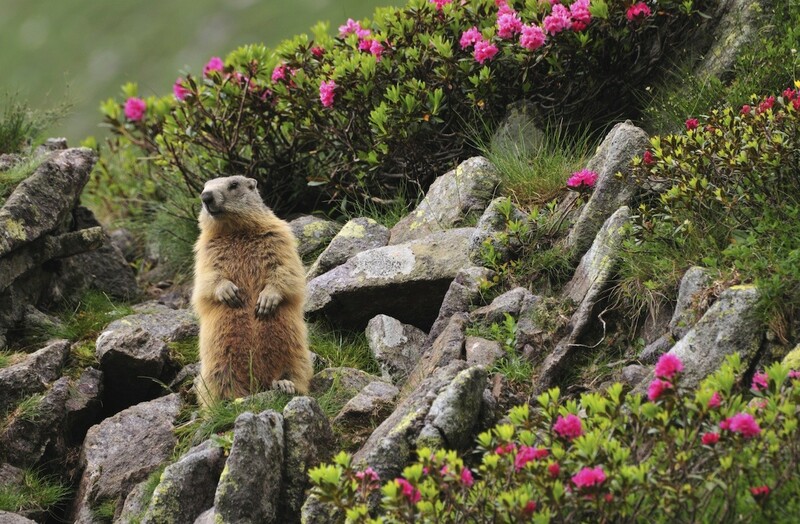 Known to spook a range of animals, marmots are not comfortable hearing this sound when openly foraging or traveling. Third, our units can be remote controlled to turn “off/on” as well as to sound the alarm. 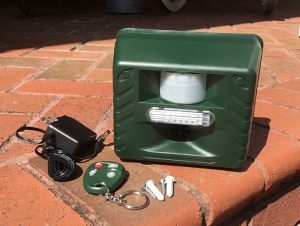 So if you have a repeller set up on your yard but see a marmot active not close enough to set off the motion sensor, you can use the wireless remote to turn it on. This will trigger it to sound which in turn will chase away any target animal. Each unit can protect up to 5,000 sq/ft easily. The ultra sound will be effective for up to 75 feet out and the audible sound can be heard up to a football field away depending on the volume setting used. Powered by batteries, you can use these effectively along property borders where marmots are likely to enter your land. Expect to get 3-6 months of life from any set of batteries and be sure to have enough in place for complete protection of your yard. The best marmot settings for our device is to set the “Operating Time” to any of the 3 options depending on when your target marmots are most active. Generally this will be “Day”. Set the “Ultrasonic” switch to “Motion Detector” and the “Motion Sensor Sensitivity” to “30”. Lastly, set the “Sonic Sound” to “80” assuming this won’t bother neighbors. You can also use the included AC power supply to power the unit via electricity. The Frequency (yellow knob) should be set in the middle. In general, using batteries and motion detection will keep them away and out of the yard but you may have reason to keep the unit on all the time. If you have a marmot feeding in your garden but not living on your land, the use of urine alone will probably not be strong enough to chase him away for good. This is because the lure of food is so strong most marmots will take the chance of passing through the regions where predator scent is located because they need to feed. In situations like this, the use of a live trap is the preferred method of control. Marmots are easy to trap and the LT111230RD is usually large enough to trap any marmot that might be foraging on your property. Place the trap where you see marmot trails, footprints or entry ways to your garden. Use a small amount of any plant or vegetable as lure (what the marmot has been targeting) and you should be able to trap them within a few days. 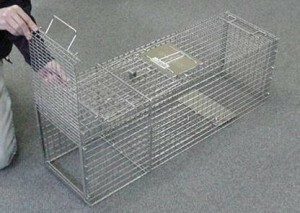 Now if the burrow is on your property, the LT111236BD live trap might be the way to go. It features a “bottom entry” doorway which can be placed directly over their entrance/exit hole. This will effectively “force” them into the trap when they come out and makes catching them easy. For either live trap, the fruit or vegetable they’re targeting in your garden will usually be the best bait to lure them in. But in cases where you’re not sure what they’re eating, go with some MARMOT FOOD LURE. This plant based food lure works well on foraging marmots and a tablespoon or two placed in a small plastic tray will do the trick. Lastly, marmots can be controlled using kill traps that can be placed either over their den entrance/exit ways or over holes they’re using to pass through a fence or other border. The 220 BODY GRIP is the preferred size and will kill them within seconds. Once the problem marmots are removed from your property, use one of the predator urines listed above to keep new ones from foraging onto your property. Marmots can be a problem once they start nesting or feeding on your property so don’t let them get established. Live trapping is an easy way to remove unwanted marmots but if they’re nesting in your yard or garden, kill traps may be required to get rid of them for good. Once removed, use some animal urine to make sure they don’t come back.